Attr. Italian, mid 17th c.
In the sixth part of his book, L'Arte Vetraria, Antonio Neri presents his recipes for enamels. These are a form of glass meant to be applied in thin layers like paint, and fired quickly. In the early seventeenth century, enamels were used to decorate both glass and gold. Neri does not present any methods specifically for enameling technique, but he does praise the talent of a good friend, who worked on glass in 1601, at the Casino di San Marco in Florence. 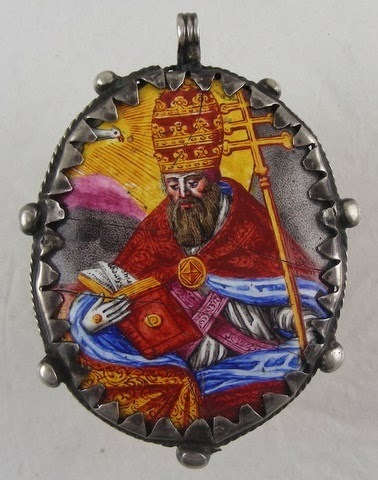 "At that time, the task of scheduling furnace work fell to the outstanding Mr. Nicolò Landi, my close friend and a man of rare talent in enamel work at the oil lamp."